Caption slip reads: "Photographer: Gaze. Date: 1952-03-05. Reporter: Gaze. Assignment: Mary Rogers divorce. #87-88: Mary Rogers Brooks, who obtained interlocutory decree of divorce in Santa Monica today from husband, Walter Brooks. 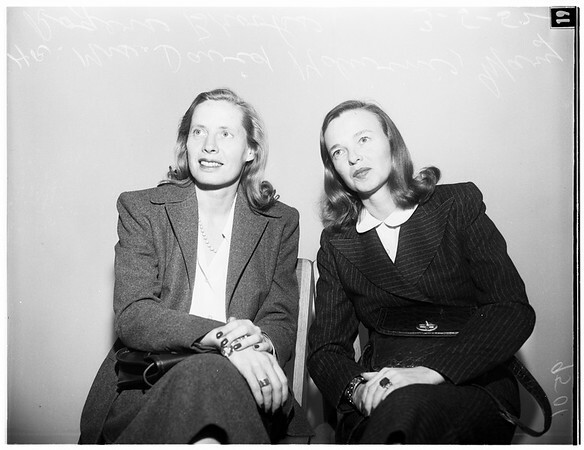 #19-29: L to R: Mrs. David Mdivini corroborating witness, whose testimony was read in court, (she had laryngitis) and Mary Rogers Brooks, who obtained divorce".